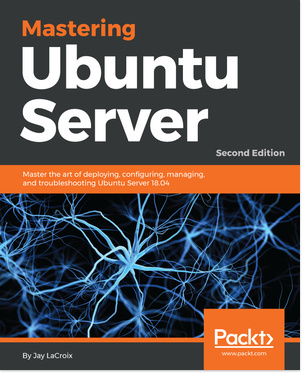 Mastering Ubuntu Server - Second Edition by Jay LaCroix (May 2018) has been recently published by Packt. This book gets up-to-date with the finer points of Ubuntu Server using this comprehensive guide. Ubuntu Server has taken the data centers by storm. Whether you’re deploying Ubuntu for a large-scale project or for a small office, it is a stable, customizable, and powerful Linux distribution that leads the way with innovative and cutting-edge features. For both simple and complex server deployments, Ubuntu’s flexible nature can be easily adapted to meet to the needs of your organization. With this book as your guide, you will learn all about Ubuntu Server, from initial deployment to creating production-ready resources for your network. The book begins with the concept of user management, group management, and filesystem permissions. Continuing into managing storage volumes, you will learn how to format storage devices, utilize logical volume management, and monitor disk usage. Later, you will learn how to virtualize hosts and applications, which will cover setting up KVM/QEMU, as well as containerization with both Docker and LXD. As the book continues, you will learn how to automate configuration with Ansible, as well as take a look at writing scripts. Lastly, you will explore best practices and troubleshooting techniques when working with Ubuntu Server that are applicable to real-world scenarios. By the end of the book, you will be an expert Ubuntu Server administrator who is well-versed in its advanced concepts. Jay LaCroix is a technologist and open-source enthusiast, specializing in Linux. Jay currently works as a Senior Solutions Architect and holds a masters degree in Information Systems Technology Management from Capella University. In addition, Jay also has a YouTube channel, available at LearnLinux.tv, where he posts instructional tutorial videos . He has also written Linux Mint Essentials and Mastering Linux Network Administration, also published by Packt Publishing.